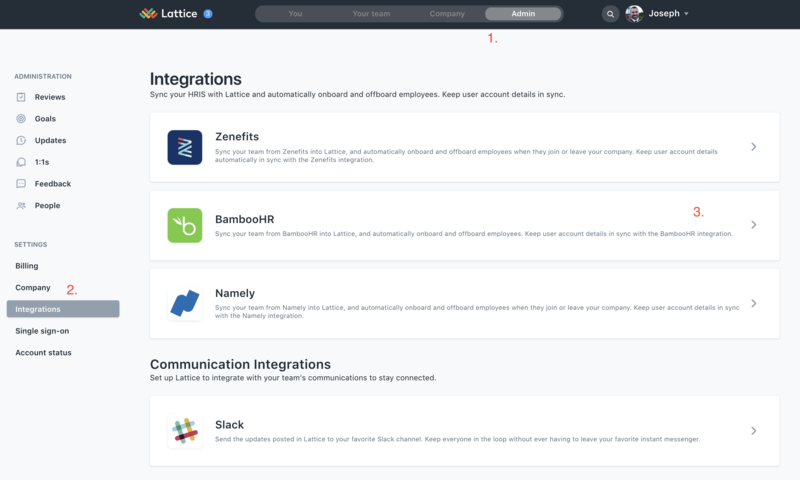 If you use BambooHR as your HRIS, you can easily set up your organization in Lattice through our integration. 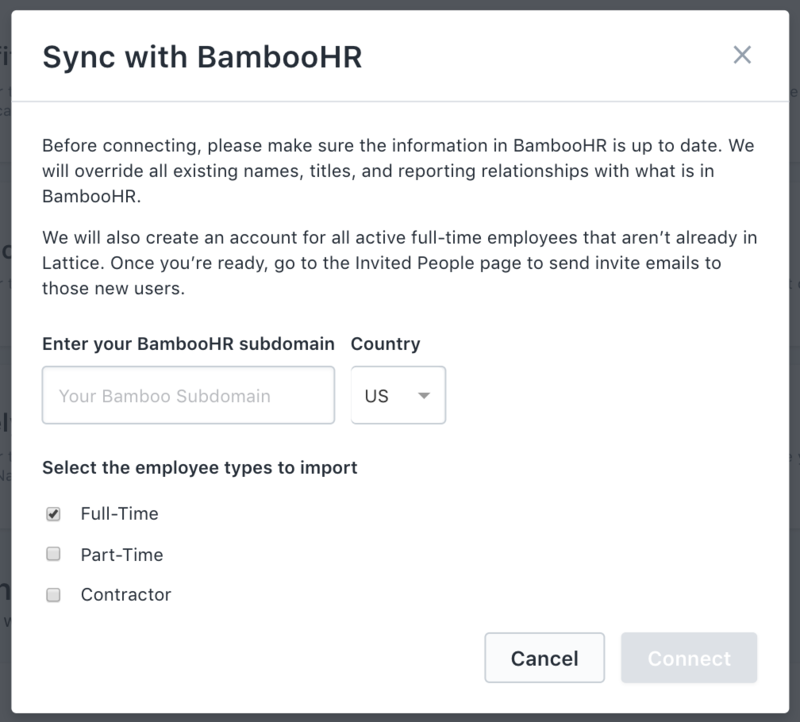 To sync your Lattice account with BambooHR, you must be an admin in both Lattice and BambooHR. Click on the "BambooHR" button. You'll then be prompted to enter your BambooHR subdomain. Your BambooHR subdomain can be found in the first part of the URL that you use to access your BambooHR account. For example, if your Bamboo URL was microsoft.bamboohr.com, then you'd enter microsoft in the field below. You'll also be asked to put in whether or not you use BambooHR for the US or for the UK. Select the types of employees that you want to pull in to Lattice from Bamboo. This corresponds to the payType field on BambooHR. 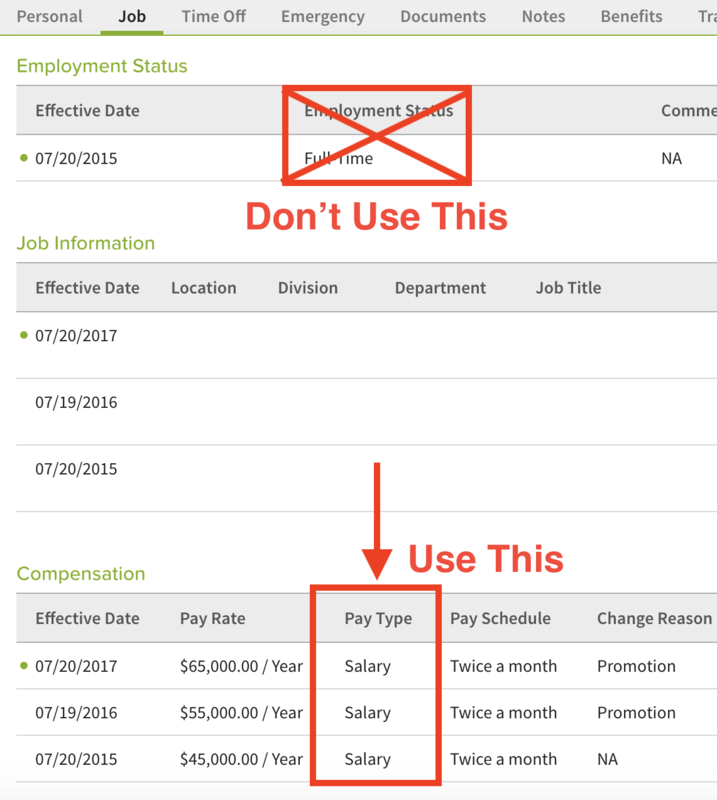 To bring employees into Lattice, you must have the payTypes set up in the "Compensation" section on the employees BambooHR profile. Clicking connect will take you through a login flow for Bamboo if you're not already logged in. Login, and then your sync will begin. 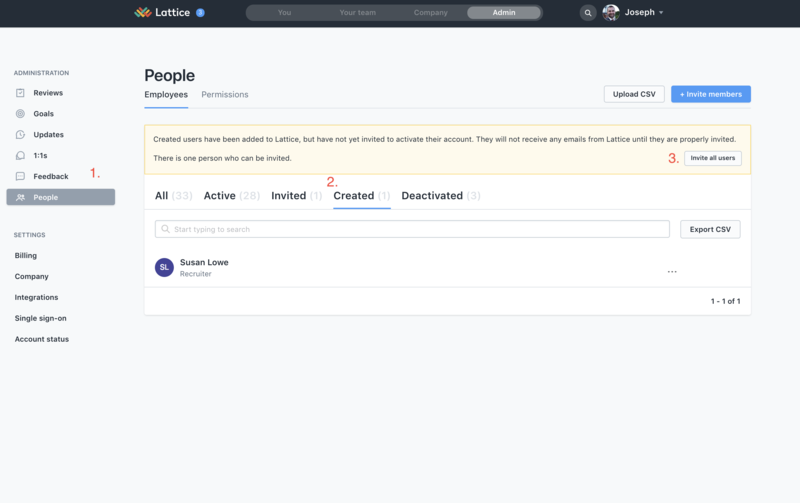 Lattice will create a user for each user fitting the criteria you selected and set their name, title, email, and manager. Once you're ready, invite them by going to Admin -> People -> Created -> Invite All Users. This will email the team for the first time and can also be used as a nudge to resend invites if employees are slow to accept. Even if you chose to auto-sync nightly, you will always have the option to manually sync during the day if needed. Please note that changes will take effect in Lattice on the effective date of the change in Bamboo. Need a demo of BambooHR? Go here.